What happened to currency fixings? The end of this year is coming up soon. But what about the end of the day, and the exchange rate at the end of a day? My general guideline to fixings is that all fixings are manipulated, which is exactly why they have been invented. It is quite astonishing that it took several decades to discover this simple fact. Never mind. Now that manipulations of currency fixings have been examined and many fines have been paid, let us recap how the fixing production has been reshaped. Baseline: Currency fixings are official reference exchange rates published by allegedly credible institutions or organizations. They are usually published for each business day. Conversely, a cutoff marks the end of a trading day and the beginning of a new trading day. Most common examples are the 3pm Tokyo cut and the 10am New York cut. Traditionally, for currency options, the cutoff time is the time on a trading day by which the holder of an option can exercise the option. Exercising it triggers a cash flow, i.e. the holder receives the call currency amount and pays the put currency amount. For this cash flow, a reference spot ST is not needed. A reference spot is only required if an option is contractually cash-settled or to calculate bespoke payoff-based derivatives values and settlement amounts. For such contracts, the reference is usually a currency fixing. Fixings can be sourced from various providers. They differ in the way they are calculated, by the sources the provider uses to calculate a fixing, and by how transparent the provider is about the fixing calculation. ECB is a daily fixing published by the European Central Bank (ECB) on the Reuters page ECB37, with delay, and only against EUR. Complaints of the trading community about the delay in publication animated the ECB to increase the delay even further. In fact, institutions that publish fixings as a reference for the valuation of financial contracts, need to comply with the new IOSCO guidelines, which the ECB has deliberately decided not to fulfill, therefore purposely discourages the use of their fixings. No comments. WMRSPOT refers to the daily fixing by World Market, previously managed by the State Street Company, acquired by Thomson Reuters on 1st April 2016. FEDFX refers to the noon FX fixing of the Federal Reserve Bank. Note is it not FEDEX. Fixing Calculations: Since 2013 many improvements have been made. The International Organization of Securities Commissions (IOSCO) published a guideline for financial benchmarks and conducted periodical reviews on the key benchmark rates used in the industry. This framework pushed the reference rate providers to publish their methodology, be more transparent and keep a stronger connection with the investment world to make their products more relevant. The fix period is set at five minutes. Snapshots of trade executed and bid and offer order rates are taken every second, starting 2 minutes 30 seconds before and ending 2 minutes and 30 seconds after the fixing time. At every snapshot, a single traded rate will be captured for each source. The trade will be a bid or offer depending on if it is a buy or sell trade. For the same time period, a bid and offer order will be extracted for each source. A spread will be computed from the order rates of this source and applied to its trade order to get the corresponding bid or offer trade rate. The trades will be subject to specific validations. Two reasons for excluding the data point could be the absence of a new trade since last snapshot or that the trade falls outside the best bid or best offer captured. All valid trades across the different sources will be pooled together. A median trade bid and a median trade offer are calculated separately. From these results, a mid-rate is defined. A standard spread will be applied to this mid-rate to compute a new bid and a new offer rate. Those rates will be published as the benchmark rate if they fulfill a specific “tolerance check threshold” that might trigger a request for review by a staff member. Bloomberg Fixing The methodology used to compute the BFIX is a Time-Weighted Average Price (TWAP) of the BGN mid rates. This average is taking into account data before and after the fixing time. Every BFIX rate is divided in multiple slices of one second. The inputs for every slice are the geometric mid rates of the BGN bid and ask ticks. The TWAP is then computed based on those data points, using a triangular formula, as exhibited in the following figure showing BFIX TWAP weights assigned to the 306 snapshots. The peak of the triangle is the fixing time and carries a weight of 10%. Around this peak, weight of every slice is decreasing linearly. 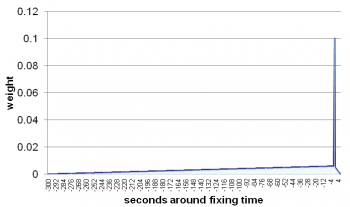 As a result, the pre-fix time weight approximately 88.52% and the post-fix time 1.48%. This common rule varies according to the time window assigned to the TWAP. This time frame is determined according to the currency. BFIX rates for currencies for the G10 countries a TWAP that starts 300 seconds before the fix and ends six seconds after the fix time. All other currencies have a window starting 900 seconds before and ending six seconds after. Overall, it is important to note the difference between the BFIX rate and the WM/Reuters reference rate for this same time. This implies not only that the methodology differs but also that the selection of the sources are different from one platform to the other. This can have relatively important impact on reference rates for currency pairs that don’t have a very liquid market. ECB Fixing The ECB fixing does not meet the IOSCO guidelines of transparency. In summary, with the new guidelines the time windows have widened, averaging has been extended, and sources are specified, and methods are continuously monitored. Fixing governance, as I would call it. “Banging the close” will become harder. I wish all our readers a happy and exciting year ahead. Alexandre de Santana Correia. Production and application of currency fixings. Master thesis, Frankfurt School of Finance & Management, 2016.
sind. Erleben Sie eine Branche im Umbruch, in der die Verzahnung von Methoden aus Mathematik und Physik mit ökonomischer Expertise immer wichtiger wird. Bringen Sie Ihren mathematischen Hintergrund, Ihre analytischen Fähigkeiten und Ihre Kreativität in ein spannendes Umfeld ein! d-fine ist mit über 500 Beratern und Büros in Frankfurt, München, London, Zürich und Wien eines der größten auf die Finanzwelt spezialisierten Beratungsunternehmen in Europa. 2­tägiger Workshop mit Vorträgen zur Finanzmathematik, Fallbeispielen und Erfahrungsberichten aus unserer Con­sulting­ Praxis. Bewerbungsschluss ist der 23. Januar 2017.